Unborn children with a severe disability are "compatible with life and compatible with love". A global initiative to bring about an end to the lethal discrimination caused by the use of the term 'incompatible with life' to describe children diagnosed with a life-limiting disorder in the womb. The term is NOT a medical diagnosis, and it misinforms families and dehumanises their children. Medical professionals can sign the Geneva Declaration on Perinatal Care to assist us in ending misinformation and seeking to achieve excellence in perinatal care. 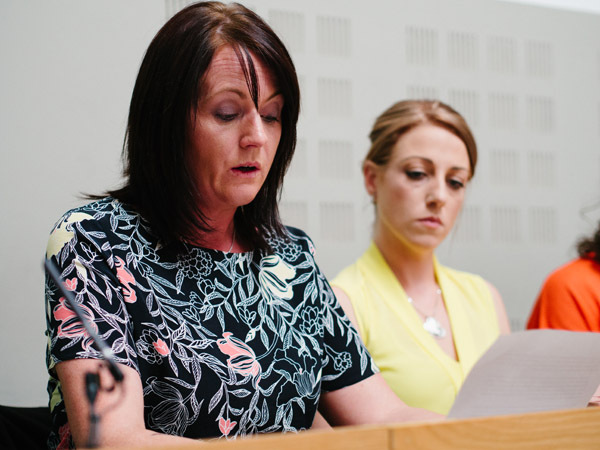 Mothers from the group Every Life Counts have given powerful and moving testimonies in support in the Dáil in support of a Private Members Bill by Independent TD, Mattie Mc Grath, seeking to discontinue the 'incompatible with life' label. 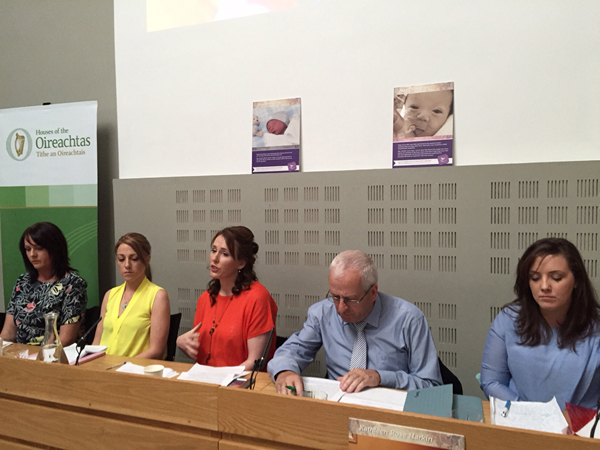 Tracy Harkin, Sarah Nugent, Mandy Dunne and Fiona Cronin spoke to TDs and Senators on behalf of the support and advocacy group Every Life Counts, who have given a voice to families whose children were diagnosed with life-limiting conditions such as anencephaly, or Trisomy 18 or 13. Most of the women have given birth in recent times, and told of their distress and confusion at being told their baby was 'incompatible with life' – a phrase that is not just offensive but medically meaningless. 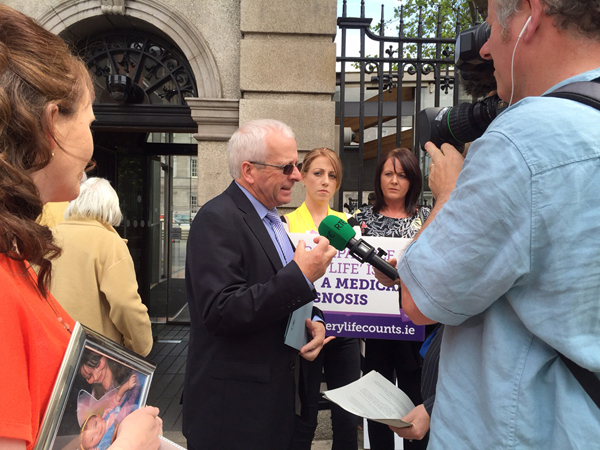 Every Life Counts spokeswoman Tracy Harkin said that "parents of children who have been diagnosed with life-limiting conditions in the womb welcomed the proposed Bill from Deputy Mc Grath which sought to discontinue offensive and misleading statements about unborn children with disabilities." "This is about ensuring that doctors live up to their professional obligations not to misinform parents, and ensuring that parents and babies get the best medical care possible at a time when they receive news of a diagnosis that can have devastating implications," she said. 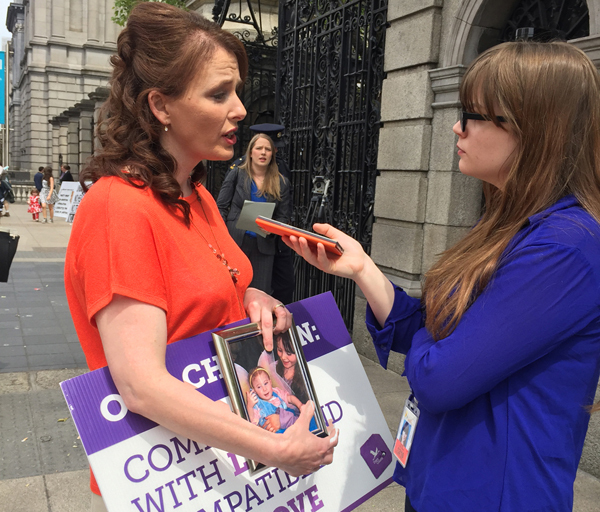 "We are calling on all TDs and Senators to support the discontinuation of a label which can lead to lethal discrimination and a lack of best care for devastated families." Politicians could support a relatively simple piece of legislation which would ensure families were not misinformed, and that children with a profound disability did not suffer discrimination, said Ms Harkin. Introducing the Bill before the Dáil, Deputy McGrath said that "in the last weeks and months we have witnessed a re-emergence of the debate on what protections should or not exist in relation to the unborn child. "The Bill I am moving today will add another voice to that debate by calling for an end to misleading and non-evidenced based language when describing unborn children with severe life limiting conditions." 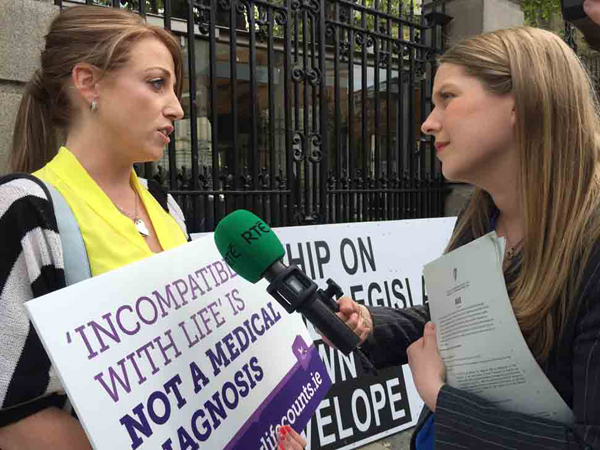 He said that the moving testimonies of families at the Dáil demonstrated "the clear and unambiguous need for the removal of the medically meaningless phrase 'incompatible with life". "As a community there are some terms we simply we longer accept. There is also a legitimate expectation that parents who receive traumatic news about their unborn child's severe disability should not then be subjected to further anguish by having such a medically meaningless phrase left ringing in their heads and hearts". "It is my genuine hope that the Government will not oppose this Bill since it is neither constitutionally controversial nor legally complex in its objective," concluded Deputy McGrath. One mother, Fiona Cronin, whose baby son, Andrew, was born with anencephaly 30 years ago had a poignant and powerful message. "My son Andrew actually lived for 27 hours after his birth with anencephaly. At that time doctors believed that it was better for mothers not to see or hold their baby if they had anencephaly, so they took him away and no one even told me Andrew was alive. "He lived for 27 hours, and he could have spent them in my arms but instead I was told he had already passed away. "That was a terrible loss for me – the loss of that time with my son. It made me realise though that we were right to make the most of our time together before he was born, the walks in the park, listening to the birds, singing songs for him, he knew he was with me and that I loved him. "I'm glad that things have improved for mothers like me now, and that doctors realise that time together is so important and precious, and that mams can hold their babies and love them and smell them and remember what they looked like and how they felt in their arms. "We can't let Ireland go backwards, go back to a time when these babies where rejected and hidden away because they had a disability which took their lives away. That was wrong, and it's wrong to dehumanise babies like Andrew by saying they are 'incompatible with life' or that they have less of a right to life because they are sick. " 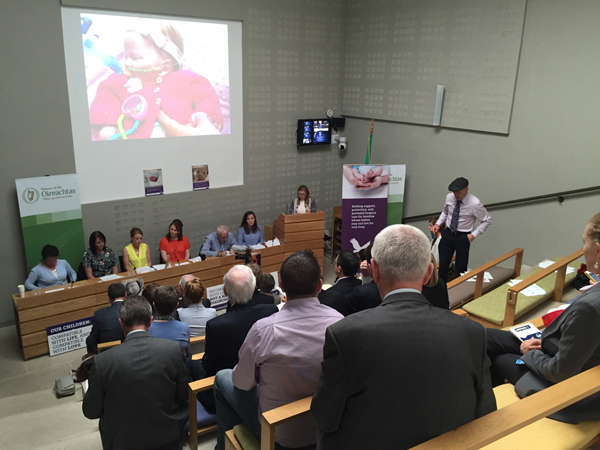 Mandy Dunne said that she was 20 weeks pregnant when her baby Muireann was diagnosed with Patau's Syndrome. She says "I was told the condition was 'incompatible with life': now for most people they are just words, but I heard them as I hugged my pregnant belly tight trying to come to terms with the fact that my little baby might not make it to our arms. I felt those words took her life from me there and then." "They made me feel I wasn't carrying a beautiful little girl, but that I was carrying merely a mass of disfigured cells that was supposed to be a baby but wasn't; that it was something that didn't even have the right to be considered as a life, dismissed with suggestions of terminations as she kicked and wriggled inside my womb. Those words instil a fear inside parents, and that's not what parents or their baby needs." Mandy's baby, Muireann, went on to live with her family for six weeks after birth surrounded by love. Sarah Nugent whose baby girl Isabella was born in August 2014, said that her daughter lived for 54 days and that "the value of these short lives is being hugely underestimated." "Every single second I had with Isabella was special, every person who got to meet her and love her, now grieve for her with me. I cannot explain the impact she's had. I'll never forget the first time I got to hold her and take her in. She was so small, and so beautiful and my heart just burst with love for her. She said that the term 'incompatible with life' meant "no help, no hope, and no intervention" for babies and families and that she wanted an end to discrimination against babies with profound disabilities. Every Life Counts launched a global petition at the UN in Geneva in March to have the 'incompatible with life' label discontinued. It has already been supported by 320 medical professionals and 36 disability and advocacy groups. The group said that it recognised that doctors and nurses are under enormous strain because of this government's cutbacks and that believed that most, if not all, medical professionals would welcome additional training and support services in assisting families facing these very upsetting diagnoses. 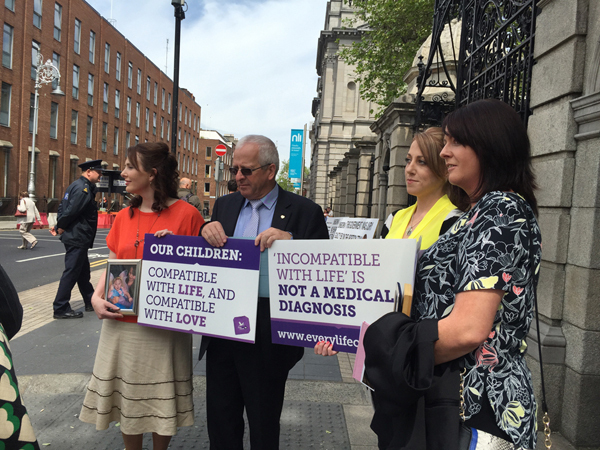 Why won't Leo Varadkar meet with bereaved parents?